DVC has a strong tradition in the building and construction areas. Our first head of Chambers was elevated to head the Construction and Arbitration List in the High Court, whilst other members have held important offices in the field such as the Chairperson of the Hong Kong International Arbitration Centre. To this day, DVC maintains a strong presence in these areas, with an army of construction specialists who frequently act as advocates and arbitrators in local and international arbitrations. 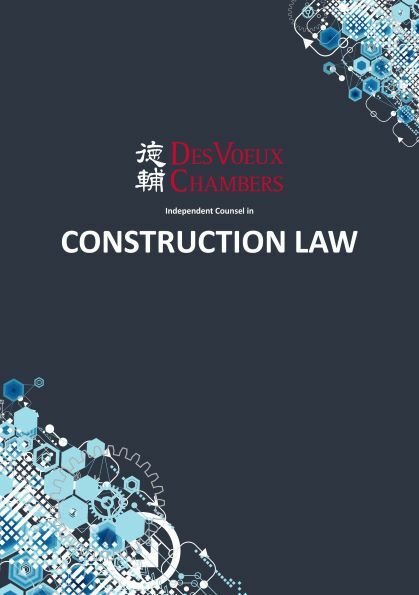 John Scott SC and a team of members are also editors of “Hong Kong Construction Law”, a leading text on building and construction law in Hong Kong. DVC houses "specialist construction silks, renowned for their stamina in big cases that last a long time" and they are known to take a "common-sense, extremely user-friendly" approach that "helps turn complicated matters into simple ones."